Peanut Butter Keto No Bake Cookies - Low Carb + Gluten Free! It’s officially time for some low carb desserts, and on today’s menu, I present to you the most DELICIOUS keto no bake cookies! The great news is, I’ve finally tapped into the wonderful world of no bake recipes! 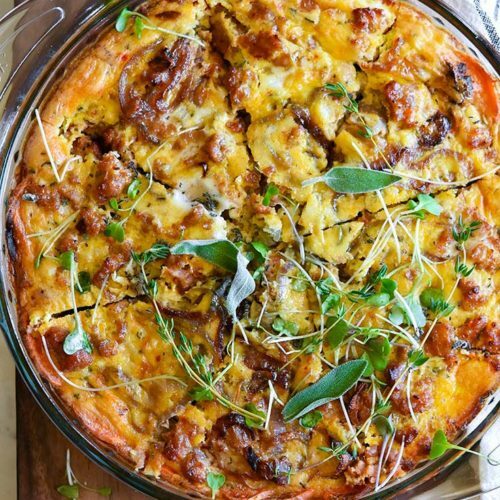 Which is a goldmine for the short on time or short on experience low carb bakers. 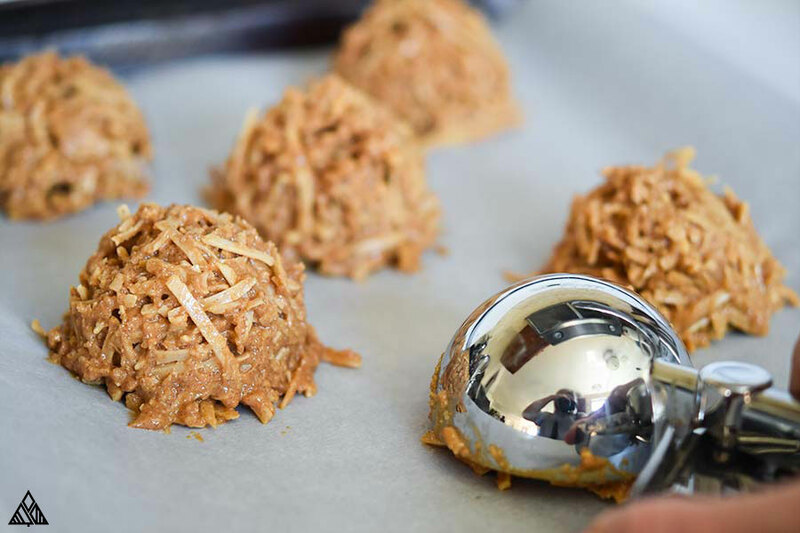 I’m most excited to share this keto no bake cookies recipe, not only for it’s pleasant flavor, but also for the ease of pulling it all together. These delicious keto no bake cookies are one of my favorite low carb desserts and will be a hit, no matter where you take them! I mean, coconut and peanut butter? They’re a match made in heaven! After having lined your baking sheet with parchment paper, melt the low carb peanut butter, butter and erythritol together in a bowl — whether you do this in a microwave or a double boiler is up to you, the end results will be equally delicious! Then make sure the ingredients are well combined — I find this is easiest to do with a rubber spatula. Mix in more of the good stuff. 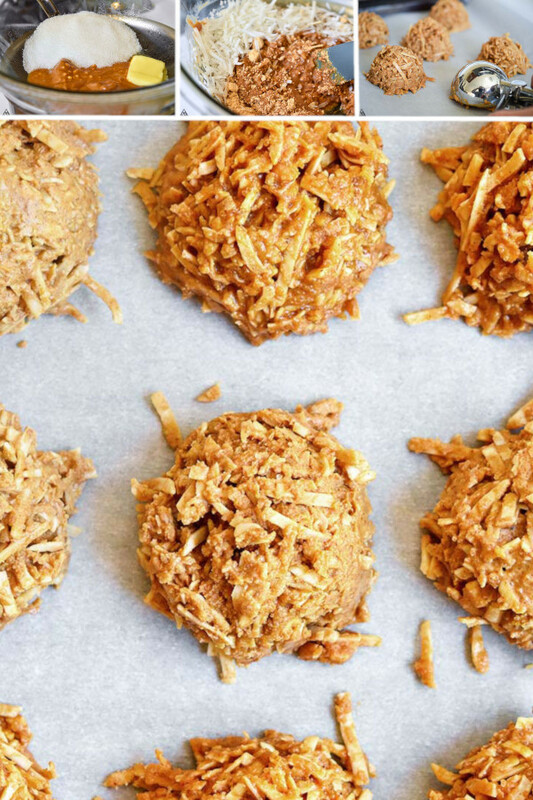 Throw in the protein powder and salt and we’ve got the keto no bake cookies ‘dough’! 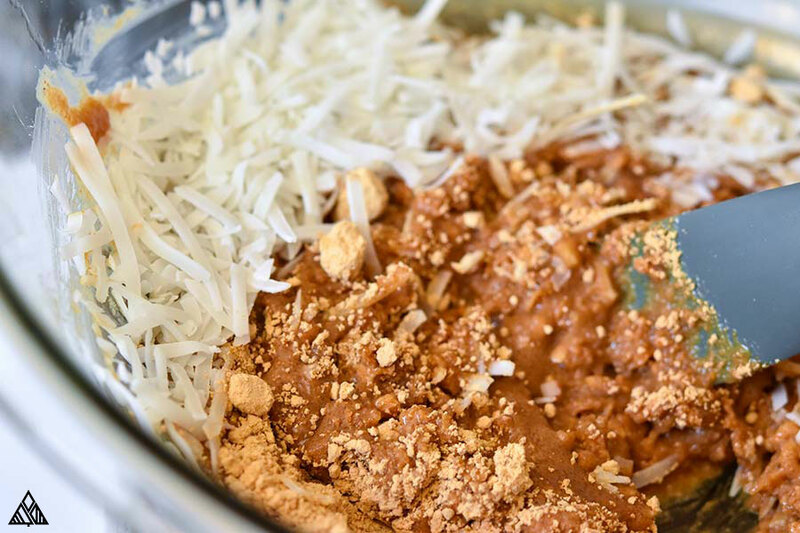 Fold in the shredded coconut and chopped peanuts, and stir until they’re coated thoroughly. Then, use an ice cream scoop to make even cookie mounds on your baking sheet. If you’d like smaller portions of these keto no bake cookies, make smaller mounds using a tablespoon. Place the baking sheet into the fridge until your keto no bake cookies harden — typically takes an hour — and enjoy! How to make no bake cookies sugar free is super simply: just swap the sugar (used in traditional no bake cookie recipes), with granular erythritol, a tummy friendly sugar alcohol, and my favorite of the keto sweeteners. The one thing I’d like to mention about erythritol, is that it has a tendency to “recrystalize” back together, and create a crunchy or gritty texture in keto no bake cookies. The best way to deal with this, is to enjoy the dessert before it has time to crystalize, or try confectioners erythritol instead. 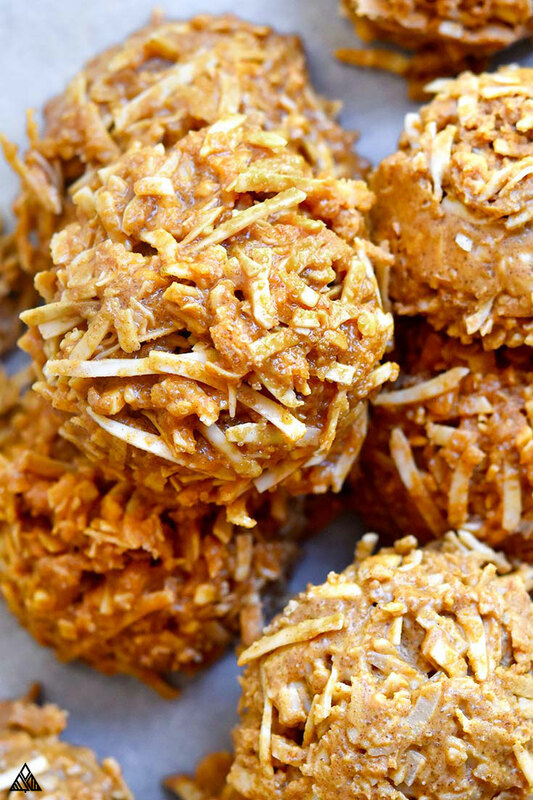 You may not even notice it in these keto no bake cookies, I’ve gotten used to it and don’t mind! We’ll also toss in some low carb protein powder, which is deliciously sweetened by a handful of sugar alternatives (this varies with every product). 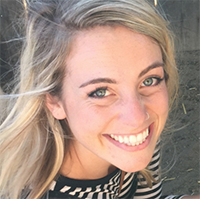 It’s important to find the best tasting whey protein powder for you — if you don’t like the taste of your protein powder, you won’t like these no bake keto desserts. I used protein powder in this recipe to sweeten the keto no bake cookies, as well as create a coating around them, so that they stay in place without becoming too sticky. 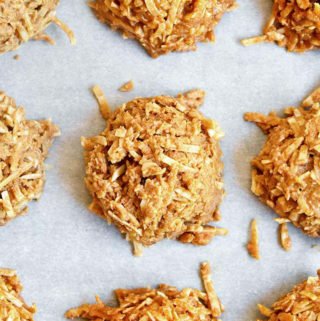 As you can see, these no bake cookies with coconut come together with a short ingredient list. Not every peanut butter is low carb peanut butter, so be sure to read the nutritional labels to ensure sugar hasn’t been added. Make sure the shredded coconut on your low carb shopping list is unsweetened. Be sure the protein powder you choose is low carb, you’d assume all protein powders are right? I was VERY surprised to find many products have tons of added carbs and sugar. These cookies are one of my favorite low carb desserts, so of course, I’ve worked out different recipes for when I’m craving a little variation on flavor, consistency and mix-ins! 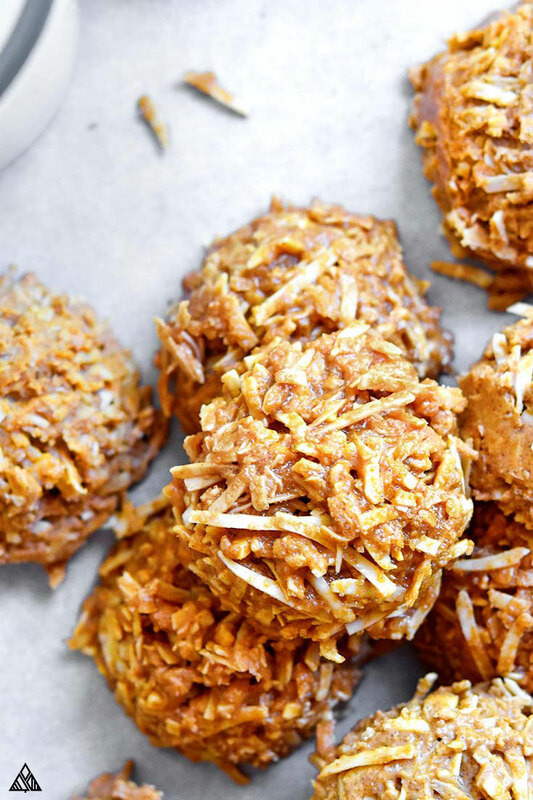 Simply swap some, or all, of the shredded coconut and mix in low carb nuts instead! Instead of whole keto nuts, I prefer to use sliced/slivered almonds or pecans for no bake cookies. Swap protein powder for peanut flour, which is made of deffated peanuts, and is CRAZY high in protein! The amount of protein/carb/fat content will vary, as each manufacture will process the nuts into low carb flour differently. Swap ¼ cup of peanut butter for ¼ of a cup of unsweetened baking chocolate — this mixed with erythritol is the base for low carb chocolate, and low carb dark chocolate (adjust the “darkness” of you chocolate with more/less baking chocolate). Storing these low carb no bake cookies is super easy, just toss them in the fridge in a bag, or airtight container! You can also stash them in the freezer, so they’re ready whenever low carb desserts cravings strike! Make small batches – It’s hard to eat a lot if there isn’t a lot to begin with! I like to make small batches of these keto no bake cookies. Freeze them! 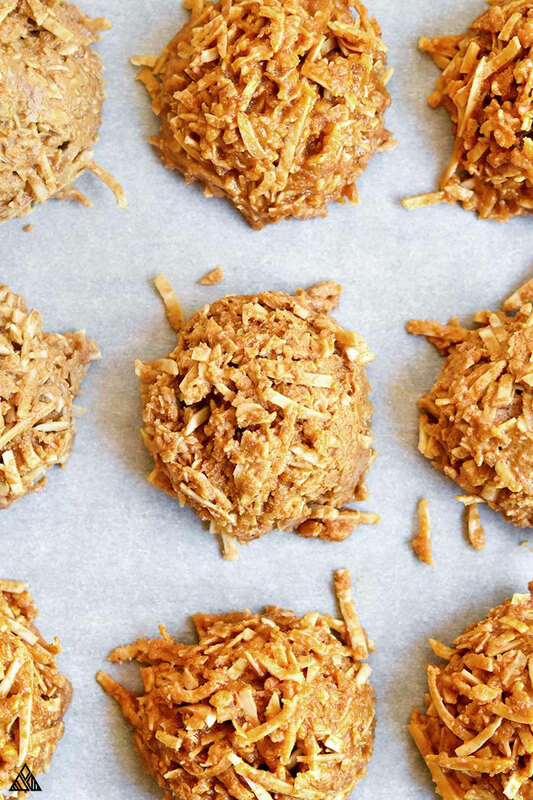 Toss these tasty cookies in the freezer. This makes them slightly less accessible than having them ready in the fridge. Don’t make them too sweet – Try making your keto no bake cookies a little less sweet than you would otherwise, so they’re sweet enough to curb your cravings, but not SO sweet that you skip your low carb meals to have one. Brace yourselves, these tasty keto no bake cookies are about to become one of your favorite low carb desserts! No matter what variation you try, these cookies will be a great success with you and your loved ones (if you choose to share!). 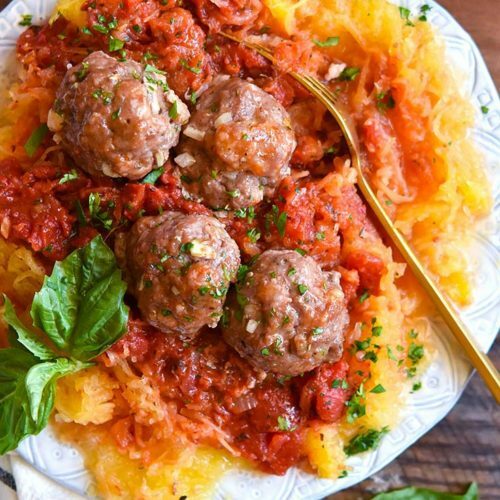 Leave me a comment below the recipe and let me know what you think! 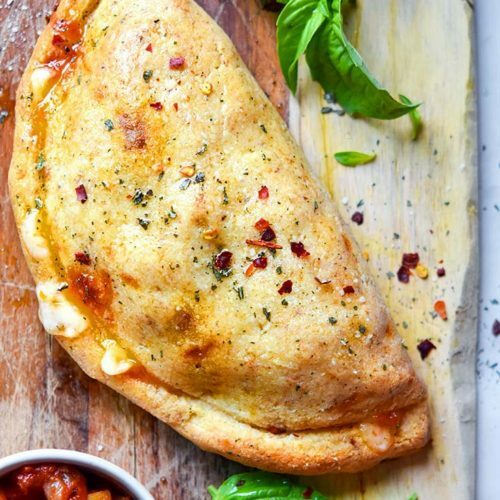 Hope you enjoyed this recipe! A super easy and tasty recipe for the low carb dessert everyone will be raving about! 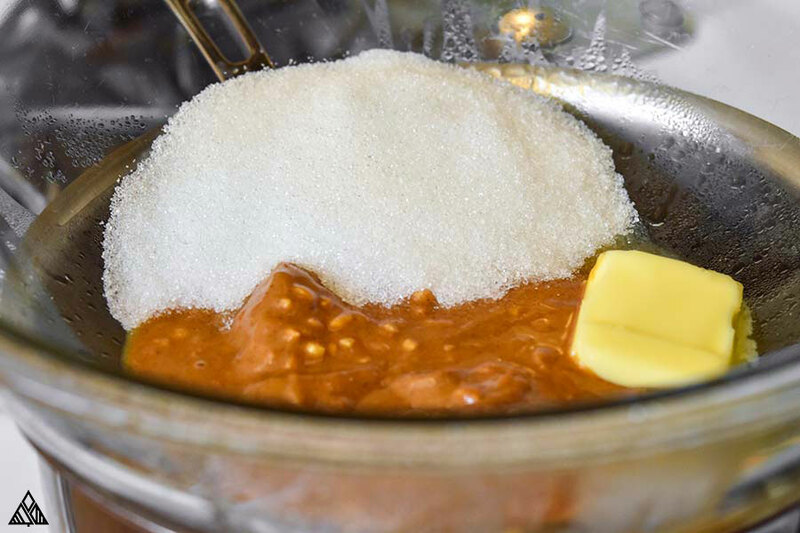 Melt the peanut butter and butter together in a bowl — this can be done in the microwave or using a double boiler. Use a rubber spatula to combine. Add erythritol, and stir until fully dissolved. Stir in protein powder and salt. 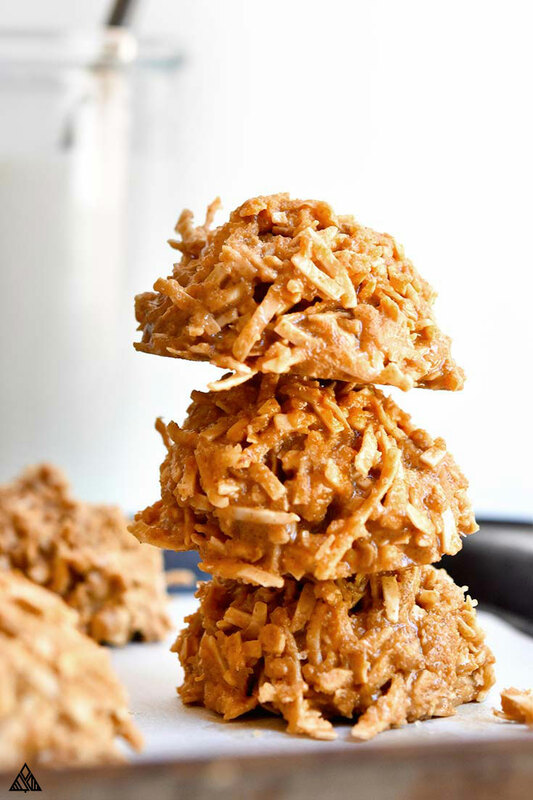 Fold the shredded coconut and peanuts into the “dough”. Use an ice cream scoop to form cookie mounds on your baking sheet. Place cookies in fridge until they harden (about 1 hr) and enjoy! The nutritional information is based on 1 cookie, if you make 8 cookies using this recipe. Use a Tablespoon to make smaller cookies, if you’d like to cut the portion size down. *Make sure you like the taste of your protein powder on its own (this will make or break your cookies. I use this vegan protein powder or this whey based protein powder. « Cheesy Spinach Stuffed Chicken – Low Carb + Incredibly DELISH!